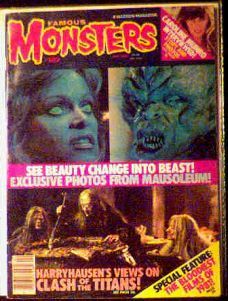 April 1982 issue of FM with features on Mausoleum and Clash of the Titans. Excellent to near-mint condition. Mausoleum starred Bobbie Bresee, a personal friend of Forry Ackerman. The film itself was low-budget but had some interesting special effects(check out those man-eating breasts). Forry loved to run photos of his friend whenever he could. She also turned up on the cover of Monsterland #1. Website design and hosting by Sohodojo Business Services. Item 147 of 466 items displayed in viewer. 0 items in cart.